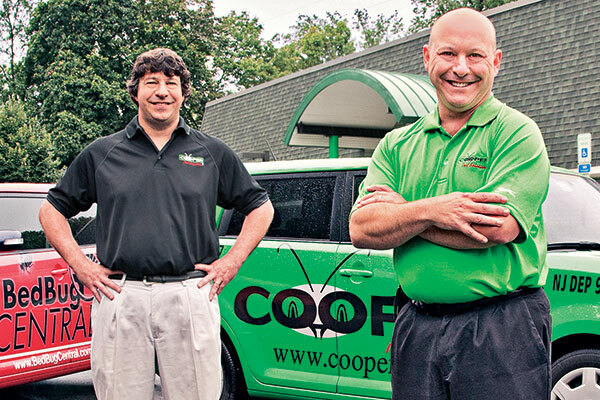 Cooper Pest Solutions fields more mosquito calls than it can handle — thanks to a detailed plan and clued-in customers. Two years ago, Cooper Pest Solutions launched mosquito management services for its residential customers. Every year since, sales have doubled. In fact, the service has proved so popular the company must limit the number of jobs it takes on each season. So why did Phillip Cooper, CEO of the Lawrenceville, N.J.-based company that his father, Theodore, founded in 1955, wait to make the leap? What will be the frequency of the treatments? Which materials will be used to treat the mosquitoes? What equipment will be needed to dispense the materials? How will the technicians be trained? What are the expectations for the client? How will the quality of the service be monitored? Once his technicians determined what would and would not work, Cooper decided the time was right for the company, for which annual revenue exceeds $9 million, to offer mosquito management services. Cooper Pest Solutions technicians use misters and larvicides to target the Asian tiger mosquito (Aedes albopictus). Because the company is located in the Northeast, mosquito management typically starts in May and continues through September. Yards are treated every three weeks. Approximately 95 percent of customers are on service plans. Occasionally, customers request treatments before backyard weddings or parties. Technicians are trained to advise customers that it’s impossible to eliminate all mosquitoes. Instead, they explain that the service will help control bites during the day, but will not prevent disease. They make it clear the service will help enable residents to enjoy their backyards more often. Any customers dissatisfied with Cooper Pest Solutions’ “Bite-Free” service can ask the company to retreat for free between scheduled service calls, or receive their money back from the time that season’s service began. So far, only one client has requested a refund. Cooper knows his residential customers have a need for mosquito management services, so business will continue to grow. “If you can provide a great service, customer retention is strong,” he says. Additional inquiries and work are coming from the headline-making Zika virus, Cooper says. The company took a scientific approach to the situation, as Dr. Richard Cooper, Cooper Pest Solutions’ vice president of technical services, worked with the company’s marketing and sales teams to create a Zika communication strategy. Setting clear expectations with customers is imperative, he explains. Residents need to know the company does not offer a Zika prevention service. It does, however, reduce the number of mosquitoes in yards to eliminate bites during daytime hours. The same cannot be said for nighttime, because the mosquito species the service targets is a daytime flier. Positioning the company as an authority in the area of pest management helps grow the business organically, Cooper says, adding that a strong online presence is key. The company markets its mosquito management services on its website and via social media. Direct mail pieces also help spread the word. 1 Comment on "Think through mosquito management decisions"
Great job, we are a Bed Bug Free member.